Was there a stand down on 9-11? In a sense yes, but there is no evidence that a stand down order was issued. There would be no reason for VP Cheney to issue a stand down order, since he issuing a shoot down order, would have the same effect. I will proceed to show this as a fact along with the disturbing fact that the President of the United States, and the Secretary of Defense, both deserted their posts in a time of war. These two individuals who are the only ones authorized to issue shoot down orders of civilian aircraft, created the stand down, by deserting their posts, and then further disgraced themselves, and their offices, by lying to the American people. Also, http://911datasets.org/index.php/PENTAGON_FBI_FOIPA_1141552 has images and video that the FBI released. The legal and political implications of 9/11 have turned scientific research in this area into a high stakes competition for the minds of the public. Pertinent information has been kept secret, the corporate media has systematically kept "damaging" information (such as video images of the World Trade Center Building 7) out of public view, 9/11 research has been marginalized, and the official investigations have failed to answer, or in many cases even address, the most troubling questions. One development that appears to be a tactic in the ongoing cover-up is the high profile promotion of transparently false theories, "straw men," the only purpose of which appears to be to allow the 9/11 Truth Movement to be ridiculed. Your support is needed for our appeal of a recent ruling by the U.S. District Court of Nevada which erroneously blocked access to responsive records from the FBI regarding the Pentagon attack and the cockpit voice recording from United Airlines flight 93. An attorney specializing in the Freedom of Information Act (FOIA) is representing the plaintiff in this case at a reduced public interest rate. Funds will be applied to appeal court filing fees, the creation of required appeal briefs, and attorney travel expenses to the hearing to provide in-person oral arguments before the U.S. 9th Circuit Court of Appeals in San Francisco, California in this matter. Unfortunately, the legal services being provided cannot continue beyond what can be paid for. Please donate today so that this extensive effort to obtain long awaited 9/11 information can be completed. 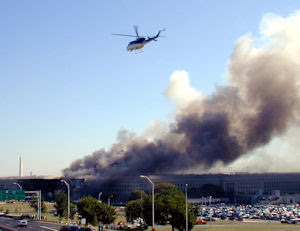 A mysterious helicopter was seen flying near the Pentagon in the minutes before the attack there on September 11, 2001. Several witnesses have described seeing the helicopter, which circled the Pentagon and then apparently landed for a brief period on the helipad, near where the building was subsequently hit. It then flew off very shortly before the attack took place. And yet there has never been any public acknowledgement of this incident, or any official explanation of what the helicopter was doing at the Pentagon at that time. While interviewing one of the witnesses to the incident, however, a Navy historian revealed that the helicopter belonged to the United States Park Police, and, the historian said, had been instructed to intercept the aircraft that was on a crash-course for the Pentagon. As the aircraft attacks of September 11, 2001 unfolded at the World Trade Center (WTC) and Pentagon buildings, maximum and near maximum augmented GPS positioning quality for the entire daylight period was provided to the geographic coordinates for the World Trade Center in New York City and the Pentagon in Arlington, VA. Based on output graphs generated by Trimble’s free and highly regarded downloadable GPS planning software , which utilizes GPS “almanac” data transmitted by the GPS constellation on September 11, 2001 and now archived at the website for the United States Coast Guard , conditions such as GPS satellite visibility and geometric “dilution of precision” are both shown to be at maximum or within minutes of maximum during the aircraft impacts at the World Trade Center and Pentagon. Such augmented GPS service is now in routine use by the U.S. commercial aviation industry to allow aircraft flight management computers to utilize precise aircraft positional information, accurate to within just several meters. This GPS service was activated on a conditional basis by the FAA just one year before the September 11, 2001 attacks . This service provided virtual aerial guidance corridors only 243 feet wide and a 95% confidence that an aircraft's true position will fall within any such designed corridor. The augmented GPS service was also utilized to precisely survey the Ground Zero site immediately after September 11, 2001. Such corridors can be navigated entirely by autopilot and flight management systems scheduled in 1996 and 1998 to be contained by United and American airlines Boeing 757 and 767 aircraft like those used during the terrorist attacks of September 11, 2001. Osama Bin Laden’s death is being celebrated, and everyone seems to repeat the old conspiracy theory that he was indeed the mastermind behind the terror attacks of 9/11. But that was never proven, and there is not even evidence hinting at such a connection according to the FBI. It is very well possible that completely different organizations than al-Qaeda were responsible for the planning and execution of 9/11, and that the latter was merely one of the involved parties. Army officers at the Pentagon were planning a training exercise that would take place less than a week after 9/11 and that would, extraordinarily, be based around the scenario of a plane crashing into the World Trade Center. Preparations for the exercise were being made about a week before September 11. 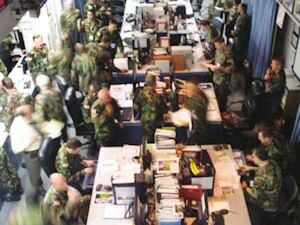 The existence of the planned exercise was revealed by Major General Peter Chiarelli, who on September 11, 2001, was the Army's director of operations, readiness, and mobilization. In that position, which he had moved into about a month before 9/11, Chiarelli was in charge of current operations in the Army Operations Center (AOC) at the Pentagon. Like Richard Gage, I too was impressed by CIT's assemblage of witnesses asserting an approach path of Flight 77 at odds with the official version, and said so. I have never believed that the 757 flew over the Pentagon, and have never stated that I did. In the light of what Gage has learned about CIT's methods, I wish, like him, to withdraw my original endorsement of the CIT video. I'm not the most tech savvy dude. This is the reason that I have never posted stuff here, but I think this time I will give it a try. Below please find a link to an interview given by Jim Hoffman, 911 researcher and engineer. I think this interview is important, even though it is now over a year old, because it clearly describes the struggle in the movement over the pentagon, and forcefully defends the view that the debate is being used to destroy the movement from the inside. I think anybody listening to the podcast should go on to read about disinformation more generally. Visibility 911 has some great links on that topic, and is one of the leading cites for 911 truth IMO.